Nothing opens up a room like a tall ceiling, but to truly inspire awe, you need an interior dome. Interior domes are commonly used in places like casinos, hotels and even private residences to make a big room feel even bigger. Historically, interior domes were an architectural necessity of exterior domes; however, due to the amazing building properties of architectural fiberglass, interior domes can be installed in just about any space big enough to accommodate their size. Interior domes envelop a room’s occupants; they turn an ordinary room into its own little world. Unlike flat ceilings, interior domes have a discernible apex and a horizon, almost like the sky. Decorated or plain, a well-placed interior dome can inspire feelings not dissimilar from vertigo. 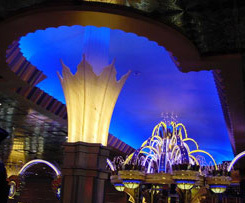 If your establishment needs a room to dazzle and inspire its occupants, then you need to talk to Stromberg Architectural Products about their custom interior domes. Historically, interior domes have been made from heavy building materials like stone, which is incredibly heavy and requires a great deal of architectural and financial effort to do right. Moreover, any time you choose to work with stone or brick, you also have to consider the cost of hiring expert masons. Architectural fiberglass is light-weight, ready-to-go and made to spec, which means you can install it without the aid of experts. Better still, it requires very little architectural support, and even the largest of Stromberg’s architectural fiberglass domes can be suspended from the ceiling for a completely seamless presentation. Whether you are going gothic, neo-classical or modern, Stromberg can fabricate custom architectural fiberglass interior domes to accommodate your taste. Since architectural fiberglass is such a versatile product, the pros at Stromberg can be as flexible as your imagination is deep. They can customize their product to imitate even the most expensive stone and metal such as marble and gold. With Stromberg’s architectural fiberglass domes, the sky is truly the limit. Architectural Fiberglass is light-weight and does not require extensive architectural accommodation. All designs are original, and guaranteed to impress and inspire your guests. 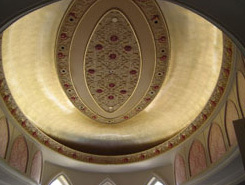 The artisans at Stromberg Architectural Products will work closely with you throughout the process to make sure your finished architectural fiberglass interior dome is made perfectly to your specifications.